So much of extending my historical knowledge has depended on serendipity. This week I was in London for a meeting and hoping to be able to visit the Tate afterwards. However the meeting over-ran and, because it was closer to St Pancras where I catch my train, I went instead to the Georgians Revealed Exhibition at the British Library. It is full of fascinating images and objects demonstrating the way in which the Georgians shaped modern Britain. One of the highlights for me was the huge map of Georgian London making up the floor of the final room of the exhibition. I can spend hours looking at maps – and often do! Afterwards I browsed through the books and souvenir objects for sale, which included among the usual mugs and posters a complete high head white wig for those wishing to dress the part! And among the books I came across a small volume that looked interesting, containing Georgian household cures and remedies. And here I discovered a Jamaican connection, for the original book had come down through the Biscoe and Tyndale-Biscoe families to its present custodian Nicola Lillie. Some readers may remember the story I told not long after starting this website of the court case involving Joseph Biscoe and his runaway wife Susanna. Joseph Biscoe’s aunt by marriage, Elizabeth Ambler (Mrs Elisha Biscoe) was the original owner of the ‘Physick Book’ in which she, her friends and later generations recorded their recipes for various potions for easing or curing everything from the bite of a mad dog to fits, bladder stones, gout, coughs and indigestion. Marilyn Yurdan worked with the author to provide the medical historical background, and although some recipes would be fairly easy to make now, it really is a case of ‘Don’t try this at home’ when you encounter Nurse Payne’s Receipt for a Sore Throat in the Small Pox containing rock alum and white dog turd! Given that as little as one ounce of alum can kill an adult (not to mention the dog turd), this is not one to copy. Nor are we likely to want to make use of woodlice, earthworms and snails, all of which were favourite eighteenth century ingredients. More benign is a recipe to make Lavender Water by simmering lavender flowers in cider; and a Tincture for Gout and Colick in Stomach was made using raisins, rhubarb, senna, coriander, fennel, cochineal, saffron and liquorish infused in brandy. My guess is that the rhubarb and senna would have made it effective for constipation if not for gout. Increased prosperity in the eighteenth century leading to a diet rich in red meat and other high protein items such as turtle, taken together with rich red wines, made gout the classic Georgian complaint. Besides reproducing the recipes, the book explains what the various ingredients were – how many of us now would recognise Burgundy Pitch, mithridate or Balsam of Tolu? even if we could safely identify coltsfoot, ox-eye daisies or camomile. To take us through these forgotten ingredients each recipe has its own glossary and an explanation of its intended use or the problem it was intended to ease. 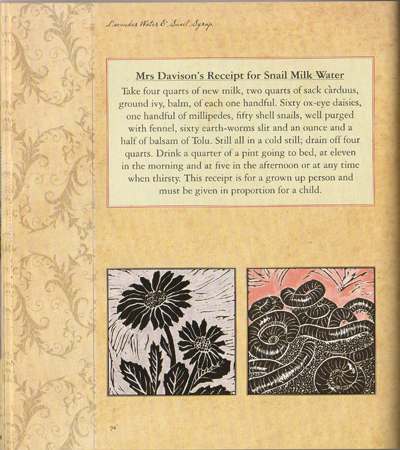 It is also a beautifully produced little book with a short, illustrated history of the Ambler Biscoe family and woodcut illustrations of the various herbs and other ingredients. Although the eighteenth century family name was Biscoe, in the mid-nineteenth century it became Tyndale-Biscoe (after the Biscoe name had been lost for a time through a female line of descent) and some readers may know the lovely Historic Jamaica from the Air by David Buisseret, in which the photographs were taken by Jack Tyndale-Biscoe. There is a large bequest of papers, maps, documents and photographs relating to Jamaica made by Jack Tyndale-Biscoe and his wife in the Jamaica Archives in Spanish Town – you can read the details of what was donated in Kenneth E. Ingram’s University of the West Indies publication Manuscript Sources for the West Indies. The collection also includes genealogical information on the Morrison, Duff and Dallas families of Jamaica and the Branch and deFreitas families of St Lucia. In addition to their connection with Jamaica, the eighteenth century Biscoe family also owned plantations on St Kitts. There are records for the slave ownership of Stephana and William Biscoe (widow and son of Joseph Biscoe) in Jamaica on the Legacies of British Slave-ownership website. Not for the first time I have been impressed by just how intertwined was the history of Jamaica with the huge changes that went on throughout the eighteenth century. Many thanks for such a lovely and positive review which I’ve forwarded to Niki Lillie. We were aware of the article on Joseph Biscoe and his marital woes, but not of this great website which I’ve only just discovered. The whole business of plantations, abolition etc is very puzzling to us as outsiders, so Niki and I were wondering if you’d be kind enough to answer any queries which might arise in the course of further research into the Biscoe, Tyndale and Earle families’ connexions with the West Indies. Of course I will answer what I can.